Thank-you Tampa International – I have wifi as I wait!! My withdrawal of a week mostly offine, I feed my addiction once more… does that make me crazy? Happy Thanksgiving America. While tables across this country I find myself in this day are covered with piping hot turkeys and apple pies, with most bellies to be stuffed and eyes glued to the day long extravaganza of football, I am happy to throw sweats over my bather and eat a steak, and not have to partake in the US traditions, even though today could be a great excuse to have a big turkey feast no. 2 of the year. And while the biggest shopping day of the year, and grandest example of consumerism, starts tomorrow morning at (gasp!) FIVE A.M.! 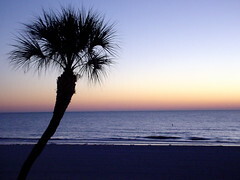 !, I think I’ll sit that ritual out too, and wake up at a civilized time, have my java, and head out to the beach for a slow, long run along the Gulf. Oh, and here’s the sunset tonight. It’s mostly been quite chilly here this week, relatively speaking of course, but a wonderful respite nonetheless.